Show 'em you count! Vote! James Montgomery Flagg's 1917 Uncle Sam, based on the original British Lord Kitchener poster of three years earlier, was used to recruit soldiers for both World War I and World War II. Flagg used a modified version of his own face for Uncle Sam, and veteran Walter Botts provided the pose. Uncle Sam is a national personification of the United States, with the first usage of the term dating from the War of 1812 and the first illustration dating from 1852. He is often depicted as a serious elderly man with white hair and a goatee, dressed in clothing that recalls the design elements of the flag of the United States—for example, a top hat with red and white stripes and white stars on a blue band, and red and white striped trousers. Common folklore holds origins trace back to soldiers stationed in upstate New York, who would receive barrels of meat stamped with the initials U.S. The soldiers jokingly referred to it as the initials of the troops' meat supplier, "Uncle" Samuel Wilson, of Troy, New York. The 87th United States Congress adopted the following resolution on September 15, 1961: "Resolved by the Senate and the House of Representatives that the Congress salutes Uncle Sam Wilson of Troy, New York, as the progenitor of America's National symbol of Uncle Sam." A monument marks his birthplace in Arlington, Massachusetts. Another theory suggests that Uncle Sam was a creation by Irish immigrants to the US who used the Gaelic acronym, SAM, or Stáit Aontaithe Mheiriceá, which is the translation for United States of America, as a nickname for their new host country. Unfortunately, however, the precise origin of the term may never be proven. Smokey is here as he mimics JM Flagg's original. 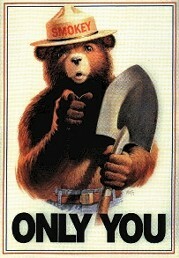 The "Only You" is in reference to who can prevent forest fires. But today, "Only You" is about the difference you can make to changing the scary stuff going on. Please, make yourself heard.